In how to calm down a dog, we’ll discover the kinds of activities that are calming for dogs, and those that get them excited. A great many people search the internet for help with getting their dogs to calm down. 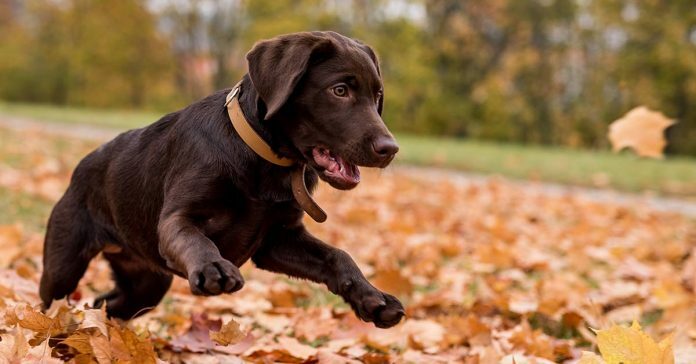 If you own a young lab between 7 and 8 months of age, It probably won’t surprise you to discover that more people are looking for “when do Labs calm down” than any other breed of dog. 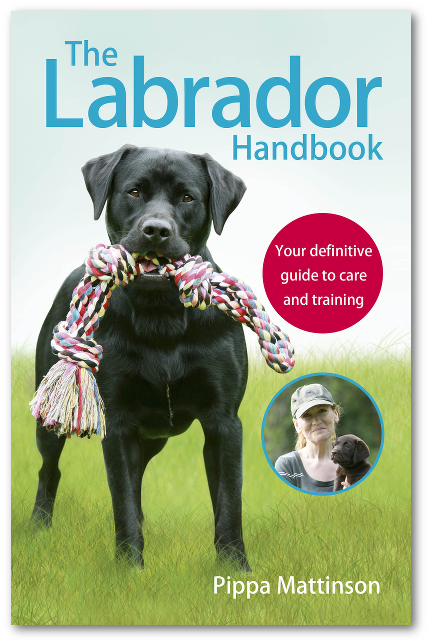 In this article we look at the peak age for excitable behavior in Labradors, and offer you some tips for coping with your lively young dog. [wp_ad_camp_5]”When do Labs calm down?” someone asked me recently. And it’s true, a boisterous young Labrador can be quite a handful. But fortunately there are several things that we can do as their owners to help our young Labs relax and calm down a little. We’ll look at those in a moment. It is not unusual for young labs of between 8 and 12 months of age, to start causing injuries through their exuberance. Knocking children over, barging into old ladies, and jumping up at visitors are common crimes. This is the peak age for excitable behavior. 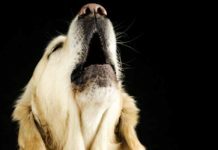 It can feel as though every social occasion is doomed to end up in tears, and it is no coincidence that this is the age at which many rescue dogs are given up to animal shelters or simply abandoned. 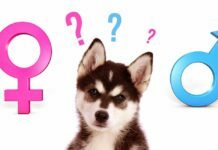 When do puppies calm down? Puppies generally reach a peak of bounciness and mischief at 5-8 months old. Smaller breeds often mature more quickly and may be pretty sensible by the time they are 9 months or so. Big dogs often mature more slowly, mentally as well as physically. When do Labs calm down? Labs can be a little later than the average puppy in reaching the point at which you suddenly realise your pup is all grown up. But hang on in there, it will come! With the right handling techniques, most young Labradors begin to calm down around their first birthday. And are fairly ‘settled’ in temperament by the time they are eighteen months old. It is important to recognise that it is possible to prolong the boisterous phase and make it much worse by making a few simple mistakes. What do I mean by hyper dog? A hyper dog is not a happy dog. He might seem happy as he leaps about – air nipping, barking, jumping at people, and so on. But he is actually a dog that doesn’t know where to put himself, and he is often actually quite upset. 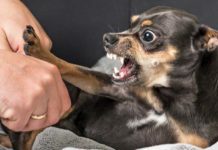 Many people are quite shocked when the nice game they were playing with their young dog begins to get rougher and rougher. You may be tempted to shout at your dog if he nips you, or to give out a squeal. If you are scared, your dog will be scared too, and like most scared kids will behave even more inappropriately. So it’s really important that you intervene before things get to this point. Remember that the hyper dog isn’t able to listen. He’s completely over the threshold and unable to calm himself. He needs you to help him. There are five different steps you need to complete in order to calm down a hyper dog. 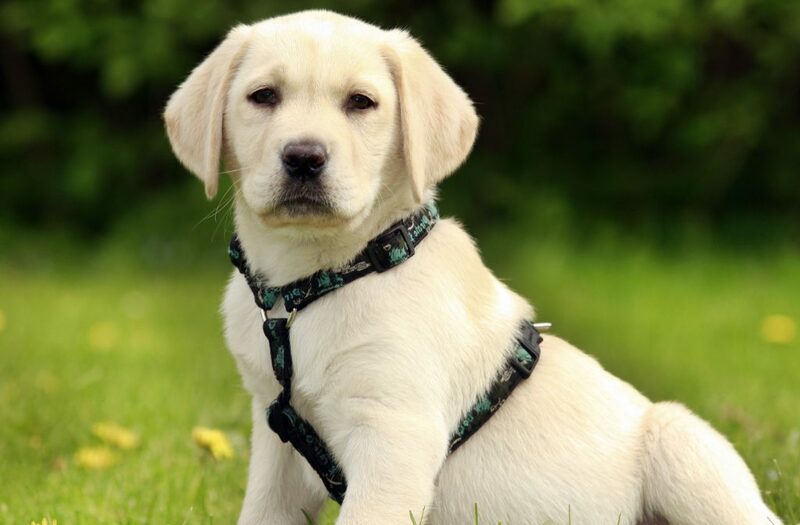 It is important to be able to control a lively young Lab and you’ll find this easier to do if he is wearing a body harness. You do not want to have to fight to clip a leash on a 70lb dog while he is nipping at your sleeves or barking in your face, so have your hyper dog wear a training leash outdoors (instructions in that link) and a house line indoors. Don’t take them off until you put him in crate or sleeping area and leave him on his own. Never use a choke chain or slip lead on a dog that has hyper episodes, he doesn’t know his own strength and he’ll hurt his neck. Outdoors, the best thing to do is to stop whatever you were doing with the dog when he got carried away and start briskly leash walking the dog up and down. Don’t hesitate, don’t try to engage a leaping, nipping dog in conversation – just pick up the leash and start walking. Keep walking until the dog begins to relax as he walks along next to you. If other people, children, or animals were exciting your dog, move him away from them. 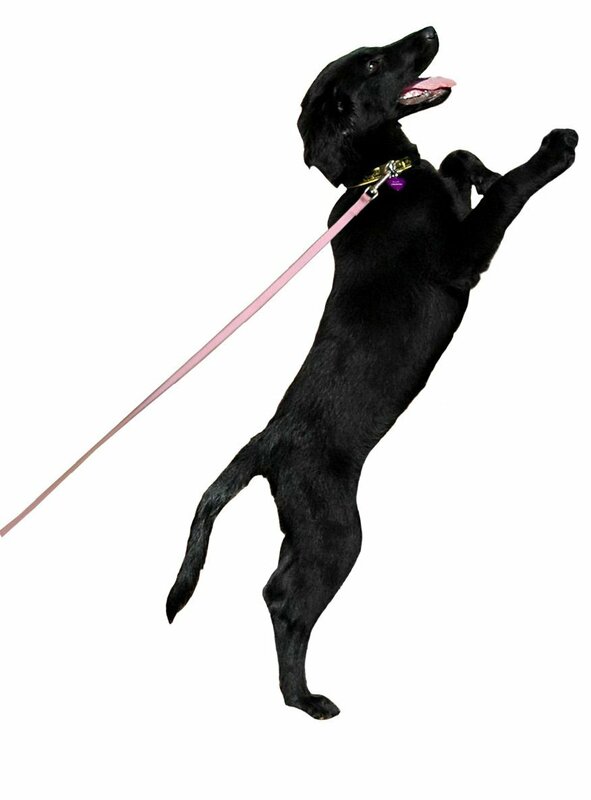 Don’t forget to attach a training lead to the harness so that you can pick up the end and lead him quietly away when he is being silly. Walking briskly but calmly around can help to lower your dog’s arousal level and let you get back in control of the situation. Indoors you can use time out. Stop all play and place the dog in a crate or room by himself to calm down for a few minutes. Give yourself a chance to calm down too, before bringing the dog back out again. Now don’t wait for another ‘hyper’ event, start putting the following steps into action to change the way you interact with your dog. Very often the owners of the dog are unwittingly causing the excitability, or at least contributing towards it by their own behavior. It is not difficult to ‘wind up’ a young dog. This is not your fault, it’s just that humans and dogs play differently and interpret one another’s behaviour differently. It’s a kind of language barrier if you like. Add a very bouncy, friendly, young dog that everyone wants to play with to the mix and it’s easy to lose your way. Fortunately, you can soon put all this right. [wp_ad_camp_2]Another common mistake that new puppy parents make, is getting involved in a lot of physical play with a large young dog. Inexperienced owners and teenage children will often rough-house with a dog, pushing and pulling him, even rolling on the ground with him. This is something you will need to avoid completely in future. No more ‘physical play’. 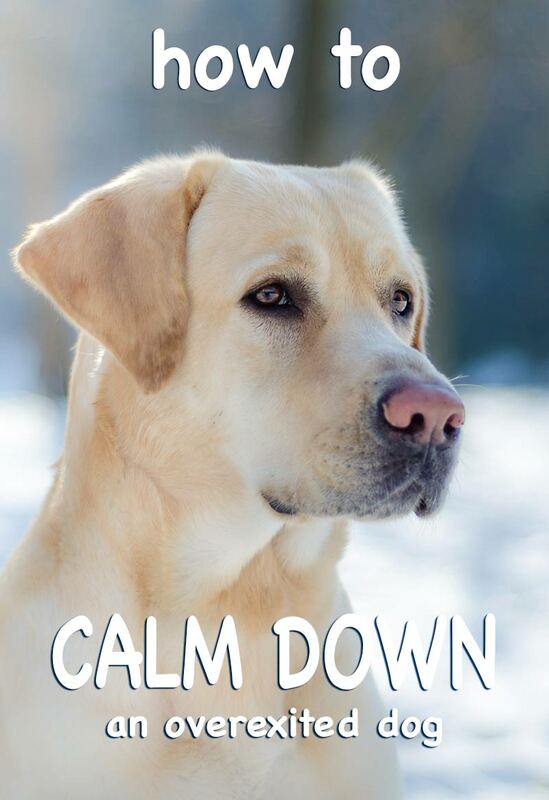 Your dog will be calm sometimes. Don’t ignore those times. My husband took one of our dogs to the vet one time for a booster. In the waiting room was an elderly couple with a golden retriever. When they arrived, the young dog lay down quietly and the owners ignored it completely, chatting to one another. After a few minutes the dog whined and both owners turned to the dog and made a fuss of it. They then started chatting again, ignoring the now quiet dog. Within a minute or two the whining began again. And each time the dog whined, the owners again paid it a shed load of attention, and each time it laid quiet they ignored it. Needless to say, within twenty minutes, the dog was whining almost constantly and starting to become agitated, panting and pawing at the couple. On and on they went, encouraging and rewarding his bad behavior. They were no doubt convinced that the dog was upset because he was at the vets, when in fact he had been perfectly happy when he arrived. Rewarding and reinforcing good, calm, behavior is really important. Young dogs need exercise, mental stimulation and attention But it needs to be the right sort of exercise and the right sort of attention. Ignoring bad behavior, jumping, nipping and so on is important. But it is not the end of the story. Your young dog needs an alternative way of engaging with his family. 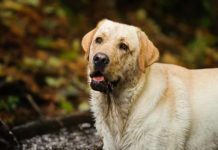 Labs are active, intelligent, sociable dogs and they need to be engaged in activities with a human companion every day for some time each day. The way to achieve this is through exercise, training and brain games. Indoors, you can use puzzle toys and indoor games to entertain your dog in a calm and controlled way. Outdoors you can focus on training your dog to do what he was born to do – fetch stuff for you. Try to increase your dog’s daily exercise and to spend some of that time engaging with him in training exercises. This will help him learn to focus on you and to enjoy the rewards that training brings. Once you have got your Lab fetching simple retrieves, you can make these more complicated so that he has to work both his brain and his body to complete them. Once his body and brain are tired, and you have put a stop to all rough play, you’ll find your dog’s behavior improving. But there is one more thing you can do to help. This is the final step in the process and the icing on the cake. Dogs can be taught and encouraged to relax at home, and even in public places. You’ll find this a useful skill to teach your dog. What can I give my dog to calm down? DAP is short for dog appeasement pheromone. Even if it were desirable to reduce excitability with some kind of drug, this is not the role of DAP. The dap diffuser is intended to reduce stress or anxiety not excitement. It may have an important role to play in dogs that are frightened of fireworks for example. But it isn’t going to make your bouncy dog any less bouncy. It’s a good idea to have a chat with your vet if you are worried about your dog’s behavior. Especially if changes in behavior have been sudden, or if your dog seems to be showing signs of aggression. Your vet may want to refer you to a behaviorist to help you with your dog. 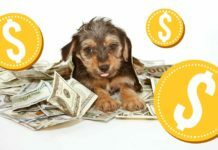 But he or she is not likely to want to prescribe any kind of drug to alter your dog’s activity levels. Even if that were possible. 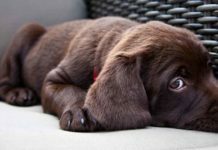 A young Lab who has frequent hyper episodes doesn’t understand how to interact constructively with people, and doesn’t understand what is acceptable behavior and what isn’t. He is very unsure where his boundaries lie, and quite apart from the misery it causes you, this isn’t a happy state for a dog to be in. Your first step is to make sure you have the means to manage your dog safely during a hyper episode. Make sure your dog is wearing a harness and line so that you can control him, and remain very calm yourself. Stop all rough play and walk the dog around until he calms down. If you are expecting visitors that you know enjoy deliberately winding up your dog, it might be simpler to put him out of the way until they have gone. Show willing visitors how to reward the dog with a treat only when all four paws are on the ground or when he is sitting quietly in his bed. Most are only too happy to join in the ‘training game’. Carry a clicker and treats around with you and treat the dog for calm behaviors whenever and wherever you can. Remember that dogs do what works for them. If your dog wants attention and you give it to him when he whines, barks, or jumps at you, he will whine, bark, and jump a whole lot more. If you play rough, he will play rough back. And he will not be able to control just how rough the game gets. Take comfort in the fact that dogs learn fast, and most young dogs grow out of this phase very quickly if people around them are consistent and reward the right behaviors. You might also find it helpful to join our forum where you can chat to the many other dog owners who have been through what you are experiencing, and come out the other side in one piece! 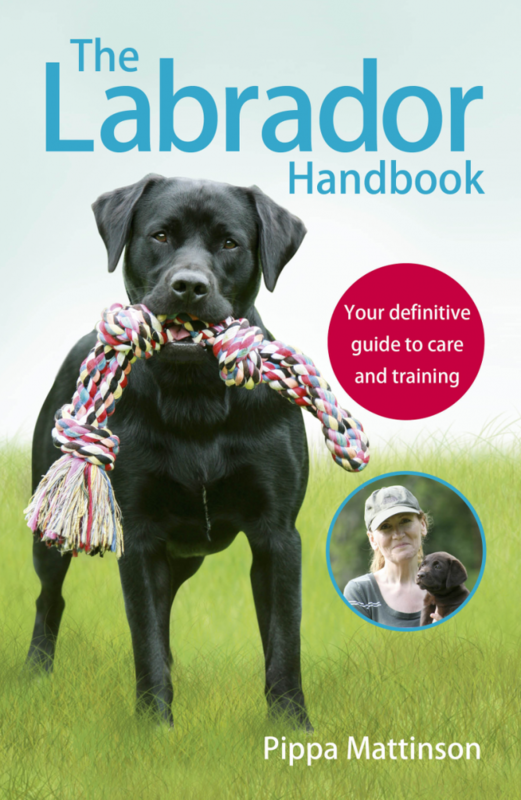 Check out our Labrador Training section for more help and advice on managing a lively Labrador. I have a female Boxer/Terrier mix I rescued from the Harrisburg Humane Society 6 months ago. She had been turned in as a stray who had obviously had puppies fairly recently. She had no ID and they could not tell me much about her except she was about 2-1/2 years old. I have owned dogs in the past and they have been different mixed breeds who have lived with me until they got old, sick and passed on. This dog, Julie, is a different kind of dog — very friendly, very sweet, very quiet at home with me — but has episodes of excitability. She is having behavior training with two trainers and responds well for them and also me to some extent. But when she has the episodes of excitability (usually when she is in the company of several dogs at a time particularly at doggie day care where she goes one day a week and loves it, and also this week at a group training session with several dogs where she thought she was back at day care and just wanted to play and jump around with them). She weighs about 60 lbs and is a very strong dog. I am 80 years old and in good health but today particularly she was impossible to control. She wanted to get into the play area where the dogs were barking. She pulled me very hard and although she wears an easy walker harness she pulled her body next to mine (left a large bruise on my leg and may have hurt her own leg since she is limping a little). She knows where she is going for this one day a week daycare and starts getting excited and making lots of sounds half way in the car ride. I noted from your article that one thing to calm her down is to walk her around outside the building before entering it. The women who supervise the dogs say that she plays with all the dogs and one thing they have noticed is that she walks calmly outside with one of them when they go out to relieve themselves. I should probably also ignore her instead of responding when she starts getting excited prior to arriving at the day care. When we go out for a walk I have been avoiding areas where there are dogs or people and she walks very calmly with me. It has been suggested that she attend more daycare visits. I have a big fenced in yard but when we are outside she seems bored unless a couple of little dogs who roam free come to the fence and they exchange barks. She has toys which we play tug with. I always carry treats which seem to be effective although not when she is in the excitability phase. Other than the above we do not do much and could do more. I’ll speak to her trainers (whom she seems to respect more than me). 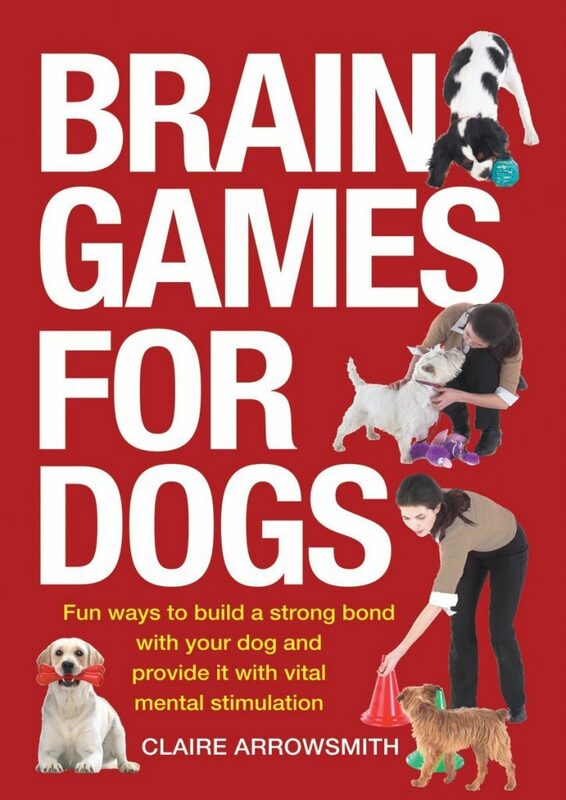 Julie is a very smart dog who catches on very quickly; maybe the brain games would interest her or the training dummy. One trainer has suggested that Julie might be a good service dog with training such as law enforcement or a school or nursing home visitor. She obviously needs more than the love and affection I give her. he comes back home along with her. How to stop him going out and doesn’t come back for hours? Please guide us and oblige.